What is it, and how do you set it up? Let iTunes - or your friends - pick the music. If you've downloaded the iTunes 8.1 update that Apple released last week, you'll have noticed that it has a new feature called iTunes DJ. This is broadly similar to the Party Shuffle option that was introduced several years ago - when it's activated, iTunes automatically selects songs either from your entire library or a specific playlist and them mixes them together. A new trick, though, is that iPhone and iPod touch users who have Apple's Remote application installed can select songs for the iTunes DJ playlist and vote on them. Songs with the most votes are moved to the top of the queue. One obvious use for this feature is at a house party: you could simply send your iPhone and iPod touch owning friends a message inviting them to make their selections. This way, they'll only have themselves to blame if they don't like the music policy. 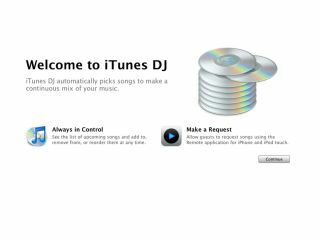 Our colleagues at Mac|Life have put together a guide to setting up and using iTunes DJ with Apple's portable devices - click here to read it.